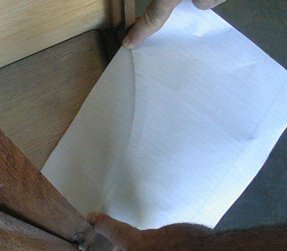 Use the following method if the glass to be replaced is missing. The following text and photos will assist you in obtaining correct measurements to replace your missing curved glass panel. 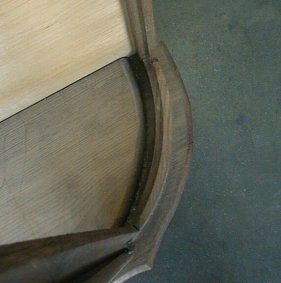 This photo shows the bottom of the frame into which the glass will fit. Place a fairly stiff piece of paper similar to construction paper over the edge of the frame. Then place your fingers as shown in the photo. You must start with your fingers in the center as you will see in the next photo. Place your fingers as shown in the photo. You must start with your fingers in the center and move them outward toward both sides to create a crease that accurately represents the shape of the curve. 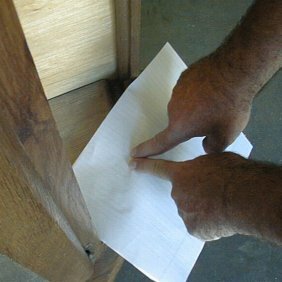 Make sure the paper does not slip or move during this crucial procedure. Slide your fingers all the way to the corners of the opening. 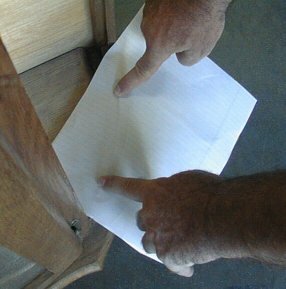 Take this paper and turn it upside down so you can see the crease better. 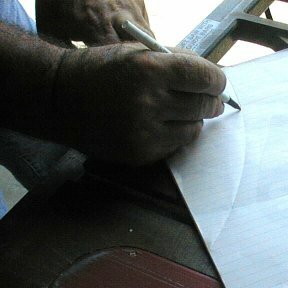 Then using a pen or small-tipped felt marker, draw this crease to make it permanently visible. Your finished drawing should look similar to the one in this photo. Two more measurements remain to be taken: width and length. These are measured from inside the frame where the glass fits. The best measuring device is a narrow steel tape or a cloth sewing tape. 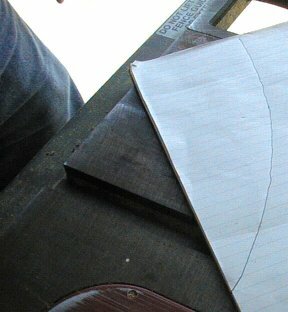 Determine the width by measuring around the curve into which the glass fits as shown in the photo. 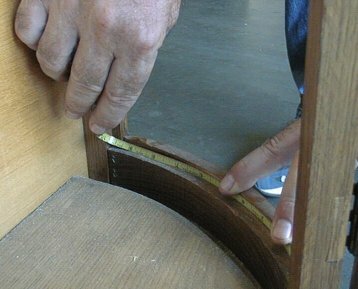 Measure the length by placing the tape into the frame and measuring from top to bottom where the glass fits. Order glass 1/8" shorter than measured to allow easier fit. Also watch for out of square frame and make allowances. Send (mail) this measurement along with the traced out-line to us and we will contact you with a price quote. electronic transmission will distort the actual size and curvature of the drawing.